The Caribbean has had a long love affair with upscale hotels, with every new opening claiming more Instagram-worthy views, designer-led rooms, gourmet-style dining, and feel-fabulous spa treatments than the last. But as savvy travellers know, not all luxury hotels are created equal. With this in mind, we’ve scaled the region’s most glamorous islands to bring you the under-the-radar and well-exposed haunts that up the ante in terms of their location, facilities, décor, clientele, and all-round exclusivity. It was near on impossible to whittle it down, so as well as our top 10 luxury hotels in the Caribbean, we’ve included a list of many other awesome luxury hotels we think you should check out, too. The setting: If it’s sweet seclusion you’re after, this sophisticated boutique resort on a hidden cove in the island’s south-west certainly has the wow factor. Only a 30-minute drive from the airport, there’s nothing for miles around other than a dazzling white-sand beach. The stay: The look and feel of this in-demand place is nothing short of sumptuous; think an attentive service from eager-to-please staff, a classy clientele (mostly couples), and seriously stunning flower-filled tropical gardens. Standout facilities include a curved infinity-edged pool, state-of-the-art gym, spa with “colour rituals” treatments based on the body’s Chakra systems, yoga and pilates classes, and free DVD library. There’s also an attractive bar for cocktails and canapés as well as a reliably good fusion restaurant where ordering off-menu is never a problem. The sleep: All of the 30 cottage suites (13 on the beachfront; 17 on the hillside) are cleverly designed to maximise the drop-dead-gorgeous views. All come with gleaming white walls, dark-wood finishes, slatted louvre windows, and large terraces with double day beds, dining tables, and plantation chairs. Luxe extras include a comfy bed dressed with crisp white cotton linens, flatscreen TV with DVD player, sound system with iPod docking station, indoor bathroom and outdoor garden shower, and generous supplies of Aromatherapy Associates toiletries. The setting: It doesn’t get grander than this pink-hued landmark hotel that has been a benchmark for luxury since the 1940’s. Overlooking St. James’ beachfront on the glittering west coast of Barbados, you’ll have Holetown on your doorstep and Bridgetown only eight miles away. 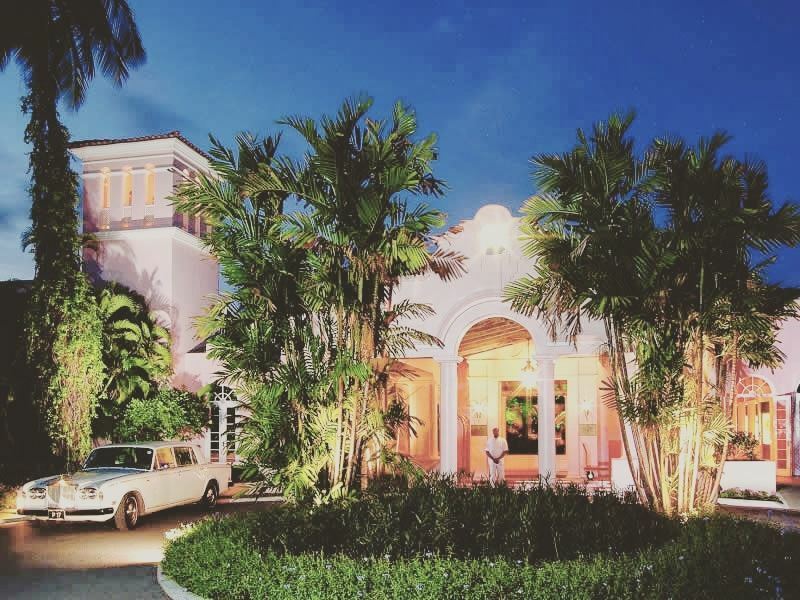 The stay: Offering English elegance infused with Caribbean charm, this gracious colonial-style estate has hospitality down to a fine art. Grown-up beach glamour prevails along with excellent ingredient-driven cuisine, superb rum-based concoctions, award-winning gardens, and attentive service from courteous staff. A lovely freshwater pool lined with comfortable sunloungers, round-the-clock gym, floodlit tennis courts, indulgent spa treatments, and daily complimentary afternoon teas with freshly-baked scones and home-made cakes adds to the appeal. The sleep: There’s 75 individually-designed rooms and suites, all of which have terraces or glass-fronted balconies with unobstructed views of the Caribbean Sea. Nice touches include a king-size bed with a pillow top mattress, flatscreen TV with cable channels, DVD player, free Wi-Fi and Internet access, and well-stocked minibar. Bathrooms have a walk-in shower, deep-soaking bathtub, bathrobes and slippers, oversized fluffy towels, and designer toiletries. The setting: This former sugarcane plantation turned swanky resort hotel nestled between the twin Pitons takes its looks seriously. As one of the fanciest stays on St Lucia’s striking west coast, it offers the best of both worlds: two blinding white beaches and a lush rainforest. The stay: The sugar-white sands set the tone for the luxury that follows; think state-of-the-art gym, dive centre, two floodlit tennis courts, glossy bars, and upscale but informal restaurants for island-style and international cooking. Elsewhere, you’ll find scheduled yoga classes, an excellent selection of watersports (windsurfing, kayaking and sailing), and an extraordinary spa with treatments rooms housed in tree houses above the forest floor. You’ll even get your own mobile device for summoning your personal butler whenever the need arises. The sleep: It’s all white-on-white décor spiced up with neo-colonial design elements and ultra-sleek furnishings in the suites, villas, cottages, and residences - all of which have decked terraces overlooking the sea. Each is kitted out with sumptuous beds swathed with high thread-count Egyptian cottons, Bose sound systems, Nespresso coffee machines, and large bathrooms with walk-in showers, bathtubs, and Natura Bissé toiletries. Some of the more expensive accommodation comes with a private plunge pool and a butler who will cater to your every whim. The setting: A hidden cove location just outside the town of Ocho Rios makes this high-end boutique property one of the smartest on the island. The vibe here is extremely laid-back, and there’s little more to do than while away the days lazing on champagne-coloured sands. 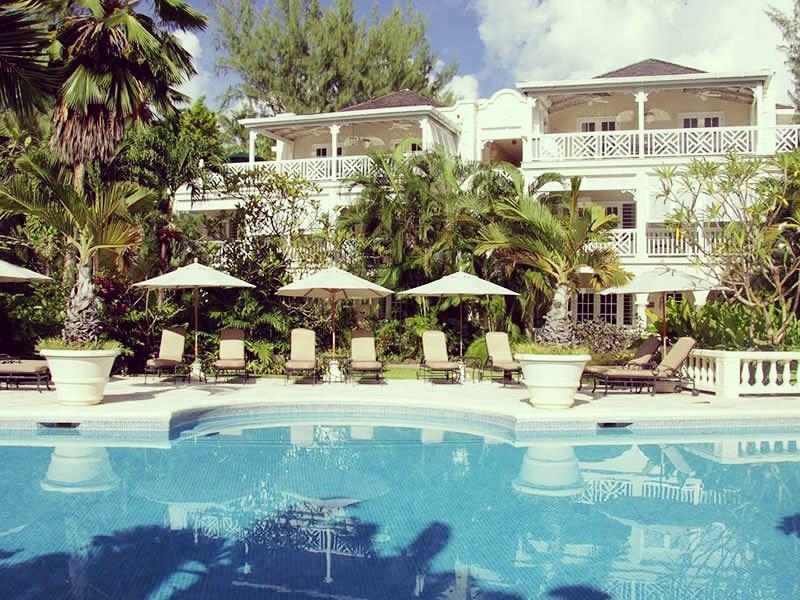 The stay: This place won’t be beaten on olde-worlde Jamaican elegance. Expect traditional colonial-style colours (mostly blues and whites), beautiful manicured gardens, balustraded pavilions, and lovely extras such as a croquet lawn and a posh spa. 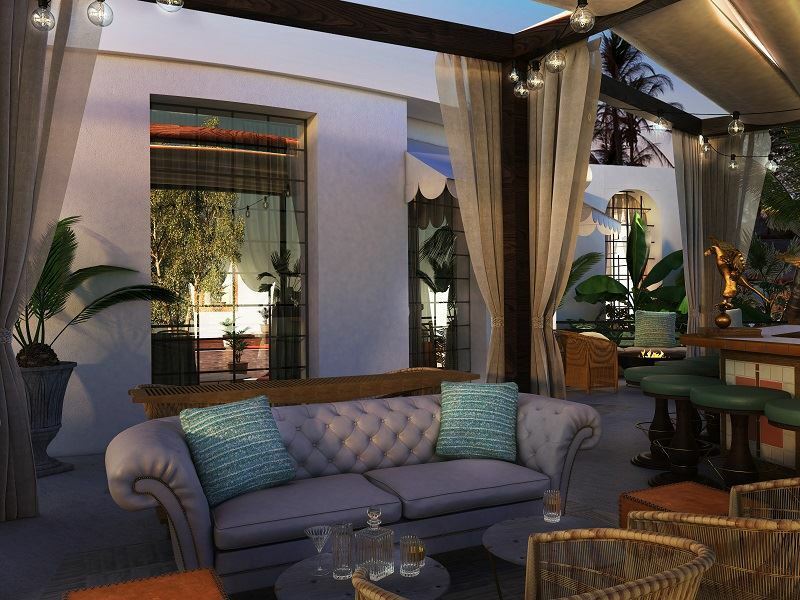 You’ll also find a refined wood-panelled bar for anytime drinks, an open-air restaurant set under a canopy of palms for Caribbean cuisine, and a gorgeous outdoor terrace for cocktails and afternoon teas. If you’re itching for action, watersports such as kayaking, paddle boarding and snorkelling are available. The sleep: The colonial design vibe continues in the 48 traditional suites and more modern cottages - all of which have beautiful sea views. Whatever accommodation style you choose, you’re assured lashings of whites and Wedgewood blues, hardwood flooring, plantation shutters, hand-carved four-poster beds with deluxe linens, and spacious balconies or terraces (some also come with private infinity or plunge pools). In fact, all that’s missing is a TV, radio, and clock - but that’s an intentional move to encourage guests to switch off and relax. The setting: The peaceful southern end of the Grand Anse Beach is the perfect setting for this low-rise hotel. Not only will you have pristine sherbet-white sands on your doorstep, but the capital of St. George's and its horseshoe-shaped harbour are just a short distance away. 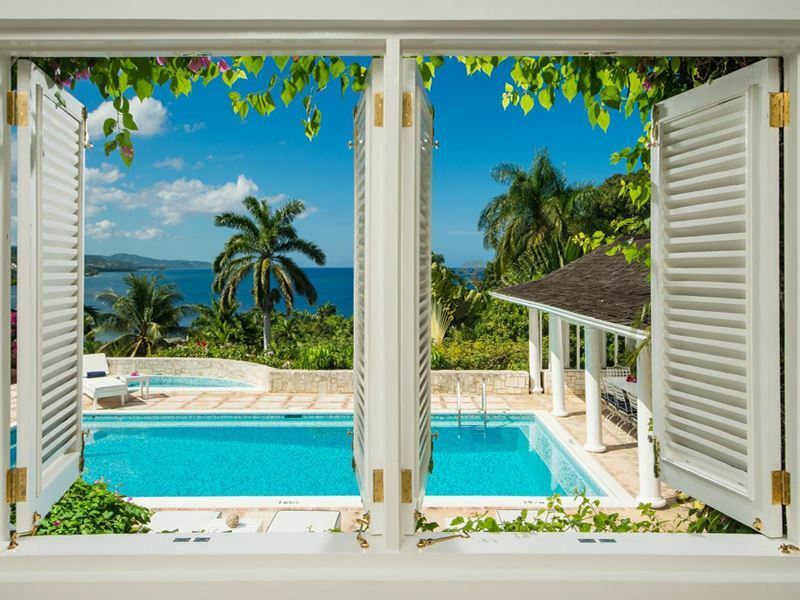 The stay: Setting the bar high for luxury stays in Grenada, this award-winning property owned and operated by philanthropist and tourism industry stalwart Sir Royston Hopkin and his family has been around since the 1960’s. Highlights include a freeform pool with Jacuzzi, a dive and watersports centre, floodlit tennis, spectacular spa, fitness centre, and incredible restaurant for elevated gourmet cuisine. The hotel offers free tennis, cycling, and golf green fees as well as a children's activity centre with video game stations and healthy snacks for three to 12-year-olds. The sleep: Designed to a high spec, the 64 ultra-stylish suites come with Caribbean décor, breezy exterior terraces, and private gardens dotted with lemon, almond, and sea-grape trees (many have plunge pools, outdoor dining terraces, living rooms with wet bars, and four-poster canopy beds). You'll also assured a huge amount of creature comforts, including flatscreen TVs with DVD players, iPod docking stations, well-stocked minibars, and good-looking bathrooms with bathtubs, showers, bathrobes and slippers, and Molton Brown toiletries. The setting: The rich Yucatan jungle and acres of sparkling white sands set the scene at this resort-lover’s wonder on the Riviera Maya, just five minutes from Playa del Carmen. Divided into three separate sections, it’s so huge that a fleet of golf buggies is needed to ferry guests around. The stay: All of the distinct areas (peaceful Zen Grand, family-friendly Ambassador, and exclusive adults-only Grand Class) deliver something exceptional. Each comes with access to a huge amount dining and drinking spots as well as unlimited use of the two fitness centres and the award-winning 75,000-square-foot spa. There’s also a well-supervised kids’ club (operating daily from 9:00 am to 10:45 pm), a state-of-the-art teen zone, and a fully-loaded activity schedule that includes scuba and dolphin adventures, ATV excursions, fishing trips, and more. The sleep: There’s a total 539 suites, all with different outlooks. You’ll find lovely views of the Riviera Maya jungle in the Zen Grand, beachfront views in the Ambassador, and expansive ocean views in Grand Class (the most luxurious of the three). All room types have flatscreen TVs with digital channels, CD and DVD players, Wi-Fi access, and spa-like bathrooms with a Jacuzzi tub and/or rain shower. Some of the more salubrious dwellings come with butler service, private plunge pools, and a minibar stocked with whatever vintage is available from the wine cellar. The setting: As the country's first five-star resort, this boutique sleep is in Cap Cana - the exclusive gated community on the island’s eastern tip. Located right where the Caribbean Sea meets the Atlantic, the beaches here rank among some of the world’s best. 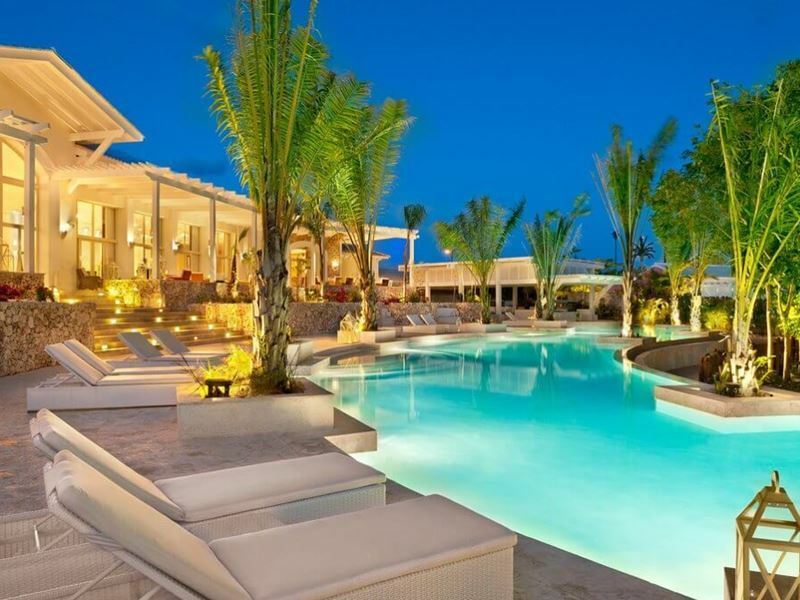 The stay: This relatively new addition to the sparkling 30,000-acre Cap Cana estate comes with off-the-scale stunning facilities; from the rolling fairways of the Jack Nicklaus-designed Signature Punta Espada golf course, to the ravishing Solaya Spa that offers world-class pampering in luxury cabanas. There’s also several restaurants for tantalising Mediterranean, Peruvian-Japanese fusion and international fare, a glamorous piano bar for end-of-day cocktails, and a colonial-style wine cellar that houses some of the best wines in the Dominican Republic. The sleep: Soft colour palates accented by rich woods, exquisite fabrics, chandelier lighting, and local art characterise the 34 boutique-chic suites - all of which come with a private pool and covered gazebo. Further luxe touches include iPads that control everything in the room (huge flatscreen TV, Bose surround sound speakers), and big beds paired with goose down feather duvets and pillows. There’s also outdoor showers and indoor bathrooms with coral stone bathtubs or marble Jacuzzis, and exclusive toiletries from Italian perfumery brand Laura Tonatto. The setting: The most celebrated address Barbados (and the Caribbean) backs onto a sweeping stretch of white beach on the west coast, just south of Holetown. The fleet of Rolls Royce Phantoms (and sometimes the paparazzi) outside this Palladian-style resort says it all. The stay: Everything here is shamelessly over-the-top luxurious from the moment you check-in. There’s three superb golf courses (two of which were designed by Tom Fazio), nine floodlit tennis courts, the island's largest and most celebrated spa with 11 treatment rooms, and a well-equipped fitness centre. Further highlights include a collection of high-end boutiques, a well-run children’s club, four restaurants, seven bars, a relaxing beach scene, and a loyal clientele that often includes A-list celebrities and royalty. The sleep: The 112 opulent plantation-style rooms and suites (plus a five-bedroom villa for the super-rich) have Italian marble floors, expansive private terraces or balconies that double as alfresco dining areas, and more high-tech gadgetry than you’ll know how to operate (even the curtains, lighting, and do-not-disturb sign is controlled from the panel on your bedside). All come with an elevated king-sized bed (or twins) dressed with sumptuous bedding, a giant flatscreen TV with digital channels, and palatial bathrooms with every ultra-modern convenience. 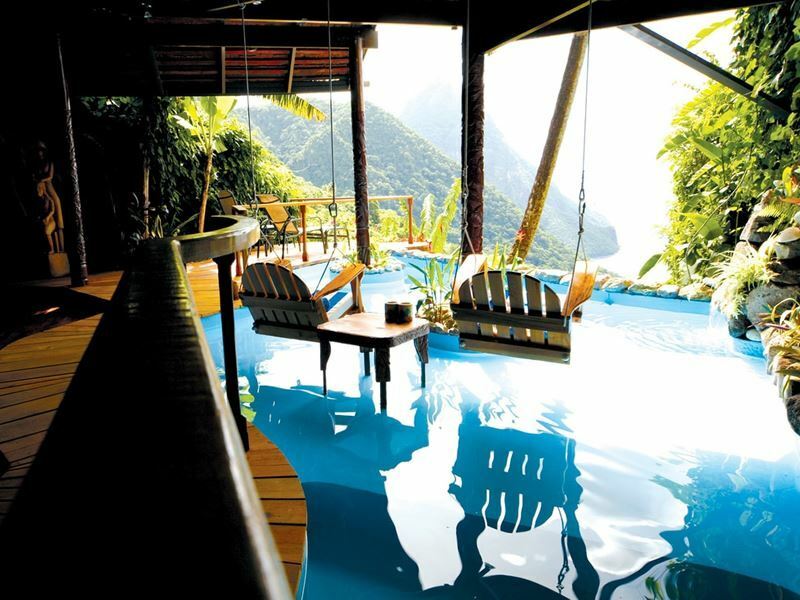 The setting: High on a hillside above the beachfront at Anse Chastanet, this five-star retreat is one of the only ones on the island offering uninterrupted views of with both the Piti and Gros Piton. The old colonial-era buildings of Soufrière are just 10 minutes away. The stay: From owner-designer Nick Troubetzkoy’s award-winning architecture to the much-celebrated Jade Mountain Club (where afternoon tea, signature cocktails, and all meals are served), everything here is decadence to the max. Facilities include two soft-sand beaches, outdoor pool, fitness studio, spa, library, and a huge list of activities for those who like to keep busy (yoga classes, nature hikes, guided sea kayaking, sunset cocktail cruises, chocolate-making lessons in the on-site laboratory, and watersports). The sleep: Accessed by bridges, the 29 “sanctuaries” (as the rooms are called) come with 15-foot ceilings, comfortable king-size beds, and just three walls - the open-air aspect allowing for unrivalled Pitons views. There’s also huge open bathrooms with chromotherapy whirlpool tubs and rain showers, and private infinity pools built with tiles selected for how they reflect light underwater. All are intentionally tech-free for a truly secluded feel, but you'll get a one-button mobile phone to keep in touch with your personal butler. The setting: It’s a posh POA affair at this 74-acre Caribbean idyll that’s long been a hideaway for some of the world’s most famous people (royals, celebs, heads of states). 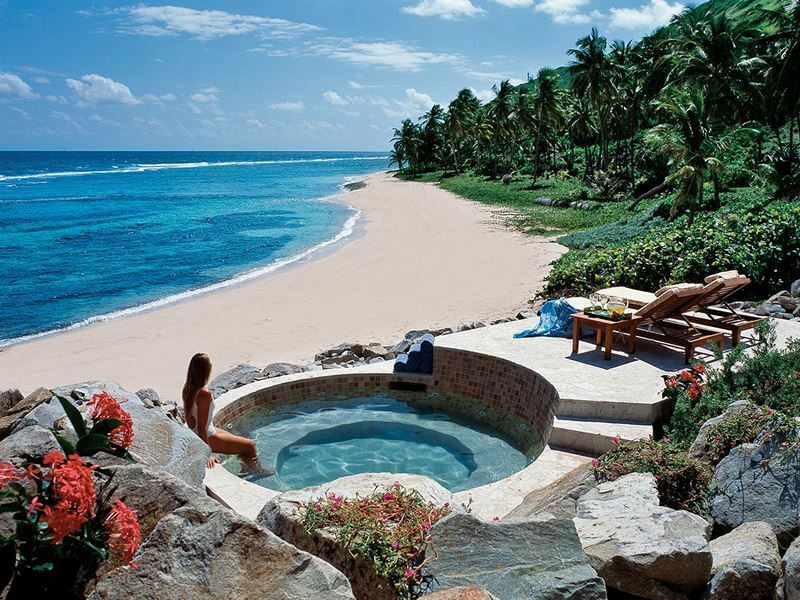 Located in the British Virgin Islands archipelago, the whole set-up is owned entirely by Sir Richard Branson. The stay: Welcoming just 30 people at a time, it’s usual procedure to rent the whole island. But if you’re pockets aren’t deep enough, there are some weeks in the year when you can book just a room and make full use of the facilities. 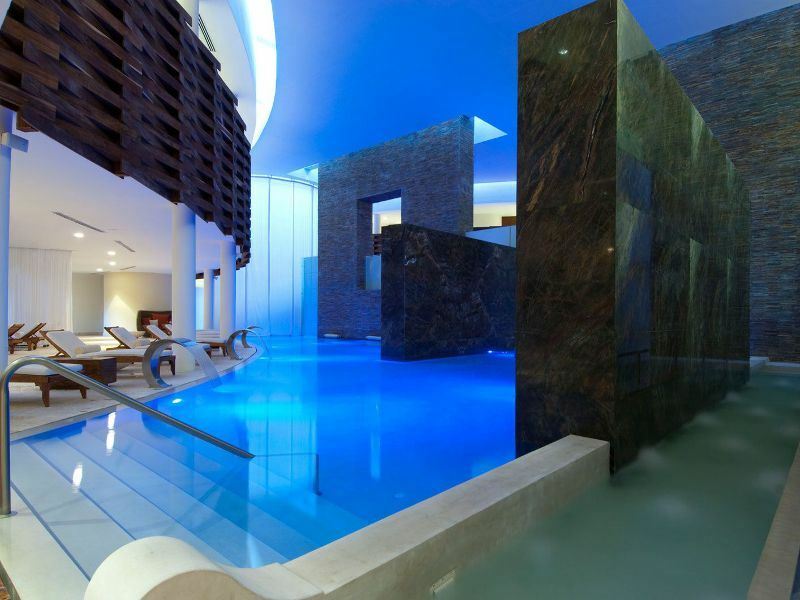 There’s a sublime spa with treatments by Aromatherapy Associates, a beach house and pool pavilion with sunloungers and hammocks, two floodlit tennis courts, a kids’ club, and a freeform infinity pool with swim-up bar. Activities include beach BBQ’s, snorkelling, diving, kite surfing, sailing, water-skiing, paddle boarding, and yoga. 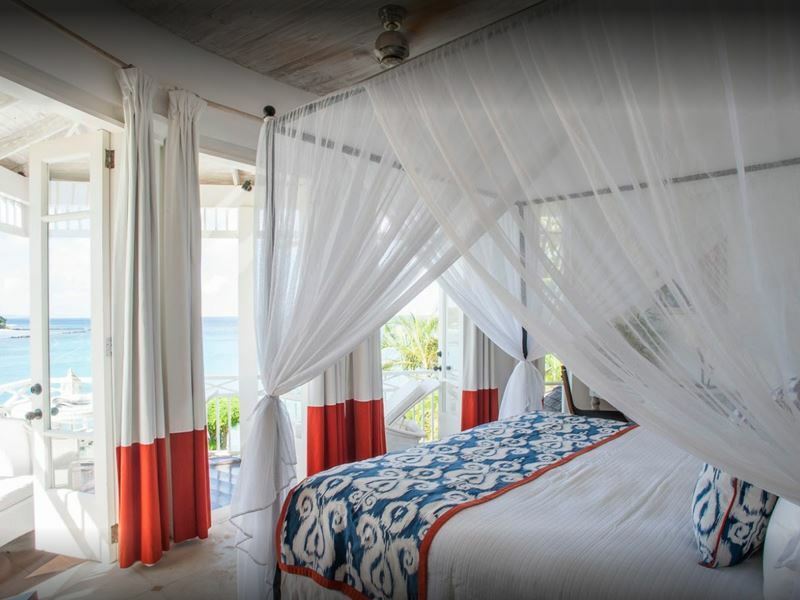 The sleep: The Great House boasts a 1,500-square-foot master bedroom to sleep up to 18 guests as well as eight rooms with Balinese-style décor, ocean-facing balconies, king-sized beds, and en-suite bathrooms. There’s also six Balinese-style houses dotted around the island and a bunkroom that can accommodate up to six additional children. All accommodation has air-conditioning and ceiling fans, UK plug adaptors, direct dial telephones, bathrobes, free toiletries, and thoughtful extras such as sunhats, kimonos, sarongs, and mosquito nets. So you’ve seen our 10 favourites, now it’s time for the rest of the region’s fabulous luxury hotels. The Caribbean has an array of beautiful getaways, and we’ve compiled the best of the rest – chosen for their perfect style, VIP-style experiences, incredible food, and impeccable service. Nestled between two peaceful beaches, Curtain Bluff offers a wonderful sense of tranquility and serenity that is ideal for a special holiday. The hotel is award-winning, and quite rightly so – you’ll get a true VIP experience here, with fantastic staff always on hand to ensure your stay is completely stress-free and downright spectacular. 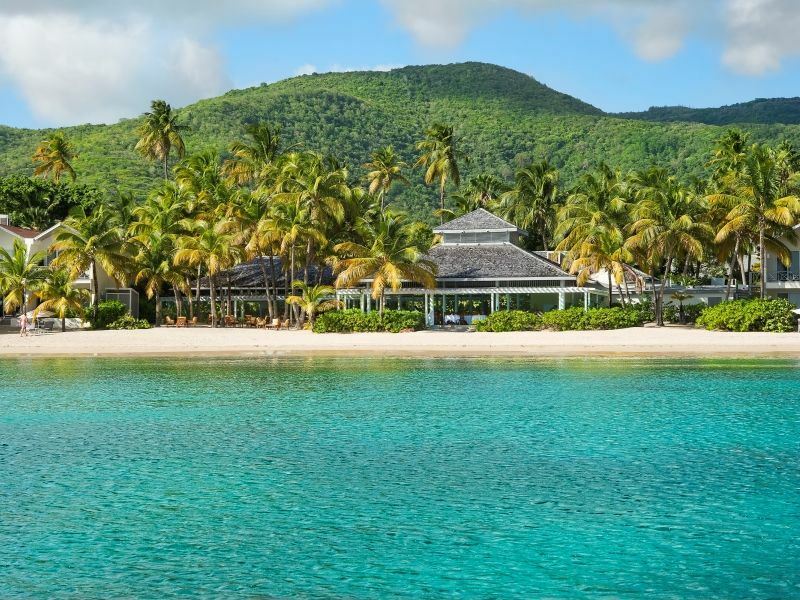 Curtain Bluff knocks it out of the park when it comes to fabulous suites. The décor adopts a classic Caribbean vibe, and all offer lovely views of the ocean. For the ultimate indulgence, pick the Terrace Suite with Private Pool, nestled on the top of the bluff and featuring an infinity edge plunge pool that looks out onto the horizon. Intimate and blissful, this is perfect for loved-up honeymooners. 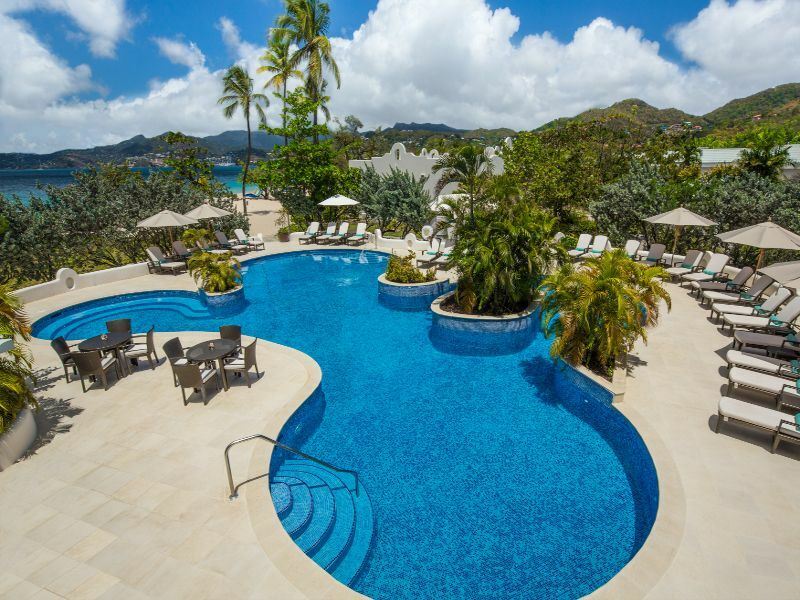 Found along the south coast of Antigua, Carlisle Bay’s stunning beachfront location is only the beginning when it comes to the hotel’s luxuriousness and charm. The sleek, modern décor creates an indulgent vibe, whilst the verdant backdrop of bright green mountains reminds you that you’re relaxing amongst Antigua’s naturally beautiful wilderness. There’s a plethora of fantastic facilities and amenities here, including a screening room showing films every night, sailing and snorkeling along the topaz bay, and a gorgeous spa with a juice bar and chill-out zone. After unwinding by the pool or indulging in a yoga class, wander along to Indigo on the Beach for a decadent BBQ on the sugary sands. The Cove Atlantis offers true grandeur and extravagance along a white sand beach on the Bahamas’ New Providence Island. With opulent décor, a spectacular beach front pool, and delicious gourmet cuisine, this hotel is set to pamper anyone who walks through its doors. Whether you’re hoping for a glamorous couples’ getaway or a fun family holiday, The Cove Atlantis caters for everyone. Interactive marine activities for children aged 6-10, a movie theatre with classic popcorn, and a car racing area will keep the whole family happy, whilst honeymooners can indulge in a wonderful massage at the Mandara Spa. After working up an appetite, there is a wide variety of restaurants to tuck into, including Mediterranean dishes at Mosaic, and elegant French dining at Café Martinique. As soon as you see this candy floss pink plantation house-turned hotel, you’ll know you’re in for a treat. Nestled on the west coast of Barbados, Cobblers Cove is very secluded compared to other hotels, and is perfect for those intimate holidays where all you want to do is unwind. Quaint afternoon teas looking out onto the ocean, soaking in a Jacuzzi tub, tucking into local specialties al fresco – Cobblers Cove is all about the quintessential experiences, all of which create a peaceful day spent soaking up the sun and enjoying each other’s company. The staff are wonderfully attentive, which only adds to the joy, and the Bajan heritage that is infused into the hotel adds a charm you won’t get in many other hotels. What could be more luxurious than stepping into a hotel for the first time, and being handed a drink? That’s only the beginning at The House by Elegant Hotels, a gorgeous adult-only resort that immediately evokes a sense of luxury and intimacy from the get go. Begin your day with a champagne breakfast, before spending the rest of the morning relaxing by the stunning pool. Next up, enjoy a leisurely glass bottom boat ride along Barbados’ west coast, indulge in a pampering treatment at the spa, and end the day with a sumptuous Italian feast at Daphne’s Restaurant. You could even go one step further with a secluded, private dinner on the beach – a truly memorable moment for you and your partner. Sometimes you just have to indulge. 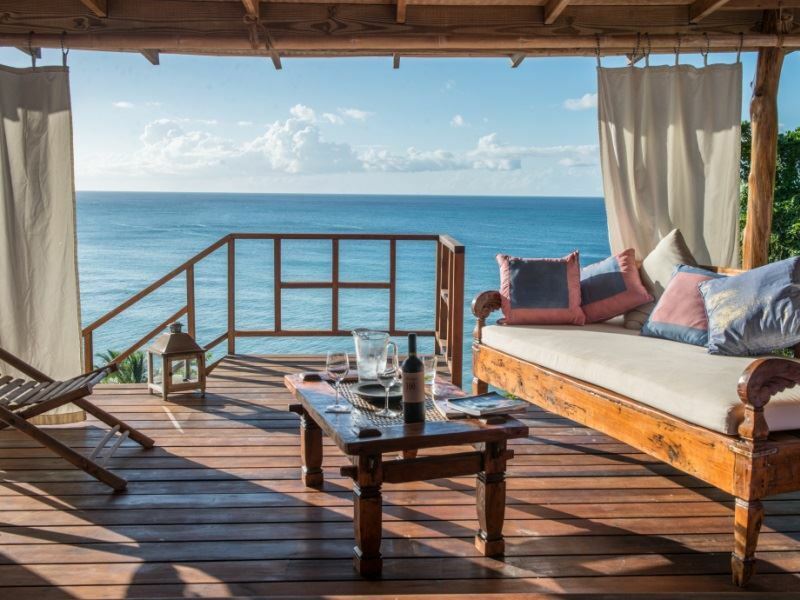 The Sandpiper is a beautiful, small hotel nestled on the west coast of Barbados - perfect for those hoping to splash the cash but keep things intimate and unpretentious at the same time. Honeymoon couples deserve the ultimate luxury, and Sandpiper’s Tree Top Suites are certainly just that. 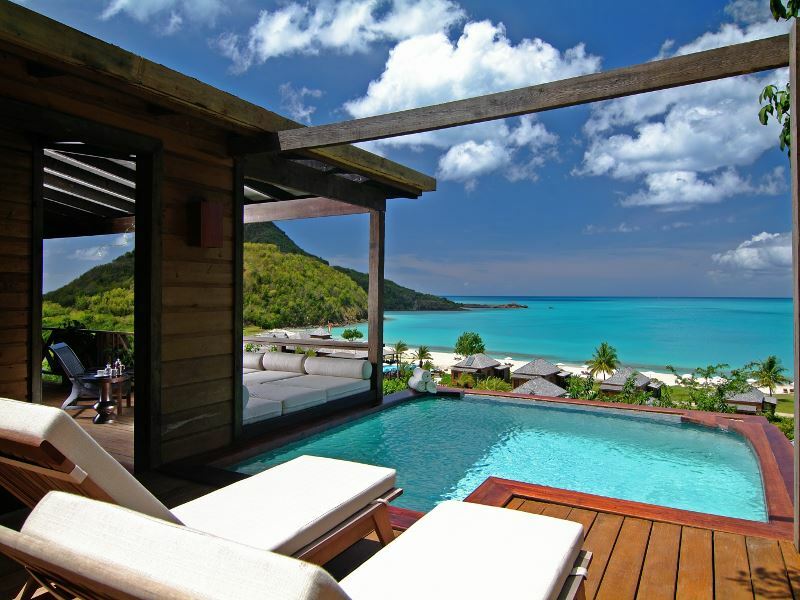 Nestled up high, the ocean views from these suites are phenomenal, and you’ll have your own private plunge pool, too. A complimentary transfer to the sister hotel’s wonderful spa is a great way to relax in the afternoon, finishing with a trip to Holetown before returning for a laidback cocktail at Harold’s Bar. This luxurious hotel soaks up a chilled Caribbean vibe, perfect for those hoping to leave their troubles behind and immerse themselves in the island’s laidback lifestyle. Coral Reef Club is found on the west coast of Barbados, and offers a wonderful plantation vibe with its wooden shutters and gorgeous covered balconies. Romance, delicious food, fantastic vistas…Coral Reef Club paints itself as the ultimate tropical paradise. The rooms are so bright and airy, you’ll have no reason not to fall in love with the feeling of fresh air sifting through the hotel. The Luxury Plantation Suite is very indulgent indeed – it has a wonderful rustic-chic feel to it, and the expansive terrace is ideal for an intimate meal for two. Luxury doesn’t just come from lavish amenities and divine cuisine – it comes from naturally beautiful locations, too. Peter Island’s breath-taking surroundings are part of the charm, from the tropical gardens, to the pristine white sands that frame the hotel. Peter Island is a privately owned oasis ideal for those hoping to indulge in unforgettable spa treatments – the two Ayurvedic doctors on-site offer remarkable traditional therapies. There’s plenty of hammocks dotted around the five blissful beaches too, perfect for spending the afternoon relaxing and drinking in the ocean views. If it’s good enough for Christopher Columbus and Sir Frank Drake, rest assured it’ll be good enough for your luxury break. Strolling along a stretch of secluded, private beach, watching the sun set across the horizon or even snorkelling in the crystal-clear waters in search of exotic marine life…that’s all in a day at the gorgeous, intimate Sivory Punta Cana Boutique Hotel. 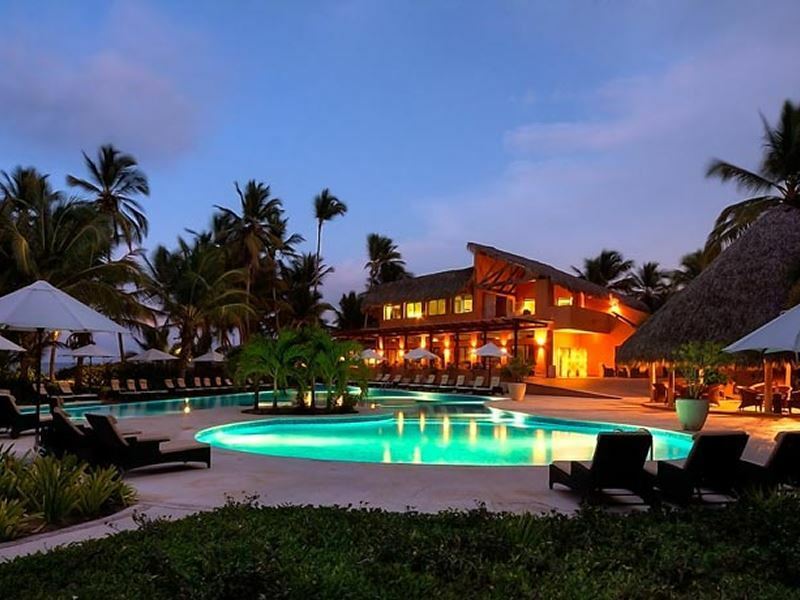 Nestled along Dominican Republic’s north-eastern coast, this lovely boutique really hones in on effortless romance, giving you ample time to enjoy each other’s company amongst stunning ocean vistas. The three restaurants and two bars offer a myriad of delicious international cuisines – including its own wine cellar. But if it’s romantic dinners for two you’re looking for, venture along to Tau for an intimate Asian dish amongst only nine other tables. Nestled on the beautiful Pink Gin Beach, Sandals LaSource soaks up the gorgeous Grenadian sunshine, offering a wonderful sun kissed oasis perfect for loved-up couples looking for an adult-only getaway. 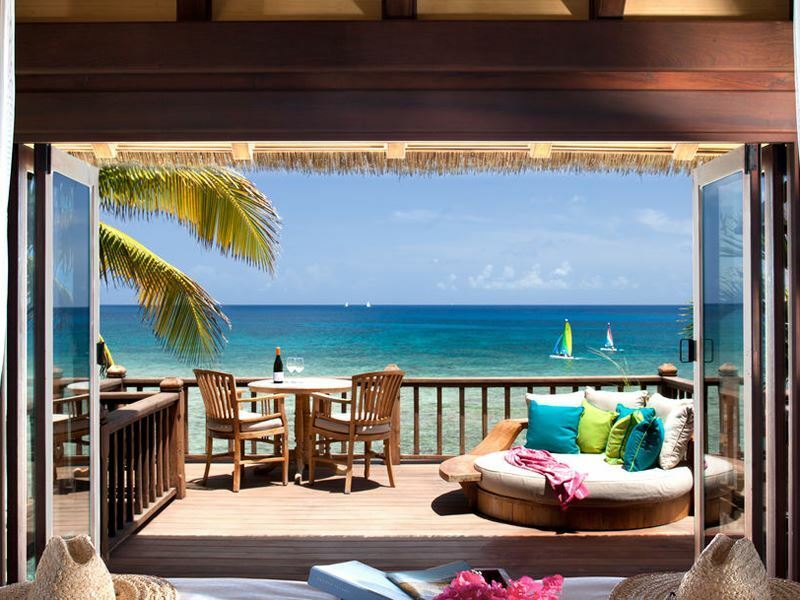 Sandals La Source is wonderfully chic and stylish. The bright and airy Mediterranean style décor creates a lovely open feel, whilst the rustic Caribbean touches of thatched roofs and lagoon style swimming pools are the epitome of the ideal summer escape. We love the Italian Swim-Up Suites, with two large doors that open out onto a beautiful ocean-view pool. The ideal Caribbean getaway always includes delicious cuisine, and you’ll certainly find something that will tantalise your taste buds thanks to the nine sumptuous restaurants on offer. Sometimes, all you need is to hide away from the modern world and simply enjoy paradise all on your own. Laluna’s location in a private hillside just above one of Grenada’s most deserted beaches is the perfect spot to enjoy a bit of R&R and escape everyday stresses. There’s only 16 boutique cottages altogether, adding to the lovely intimate feel, and we love that the hotel is influenced by its Italian owner. The scenic restaurant serves flavoursome dishes created with a mix of local Caribbean fare and delicious imported Italian ingredients, whilst the décor has a characterful Italian flair, too. This is a wonderful slice of heaven, with plenty of rustic yet luxurious charm. If you’re looking for luxury…staying on one of the world’s most exclusive private islands will certainly tick all the boxes. 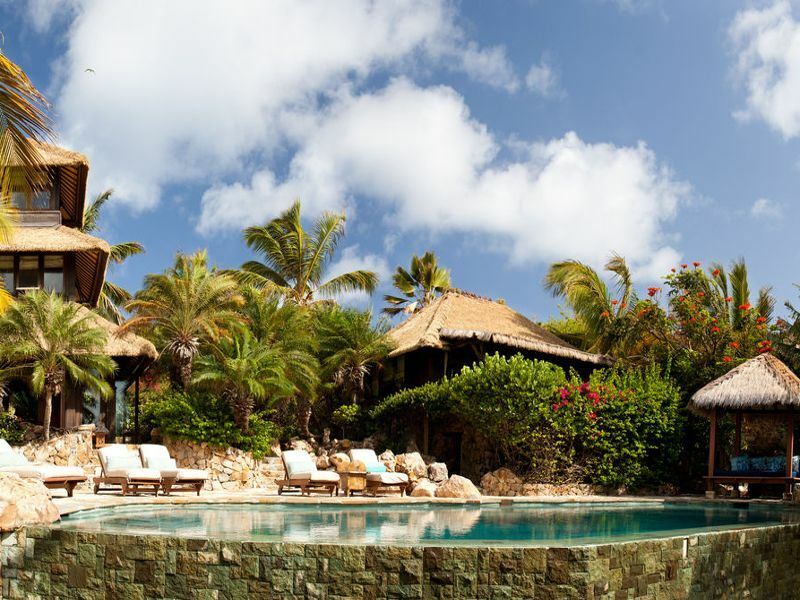 Nestled on the northern tip of Mustique, Cotton House encapsulates its location’s striking natural beauty. Now a restored 18th century sugar mill, Cotton House still oozes with vintage charm, yet also offers a lovely mix of modern facilities and interiors. The hotel isn’t only about the lavish décor, but the fabulous activities too. Whether you fancy a scenic horse ride, an afternoon catamaran trip, or simply just enjoying the private stretch of beach. A choice of three restaurants means you’ll never go hungry – and you could even dine amongst villa owners that come across the island to The Great Room for an afternoon tea and cocktails. Once a sugar plantation, this Jamaican gem is a timeless beauty, with classic colonial architecture, and beautiful décor that just oozes rustic Caribbean charm. This is certainly one of Jamaica’s most classy and stylish resorts. The room interiors were designed by Ralph Lauren, so you know you’ll be staying somewhere chic and fancy. We love the blend of thatched roofs with contemporary Caribbean furnishings, and the bright white walls really add a spacious, lavish feel. Take a wander through the picturesque gardens, or take a dip in the infinity pool and marvel at the stunning views of jungle-clad hills and crystal-clear reefs. Families are well catered for here too, with two complimentary kids clubs and brilliant water sports. Found along the sugary coast of Riviera Maya, this brilliant boutique adult-only resort beautifully blends simplicity with eco-luxury. We feel that this is one of Mexico’s most romantic escapes, ideal for unwinding with your partner and simply enjoying each other’s company in the sunshine. Set against a stunning scene of bright white sands and luscious foliage, days here are spent gazing at gorgeous sunsets, soaking up the sun by your private plunge pool, and indulging in a traditional Mayan spa treatment. The staff here are second-to-none too, meaning you’ll feel utterly pampered throughout your stay, yet still have enough space to sunbathe and relax in your own time. Stylish, contemporary, and just incredibly cool…UNICO 20 87 is an adult-only hotel ideal for trendy travellers. Mixing modern style with Mexico’s vibrant roots, UNICO will immerse you in Mexico’s culture, yet offer plenty of the luxurious amenities needed for an indulgent holiday. Nestled on the powdery white sands of Riviera Maya, we quickly fell in love with the charming local artwork that adorns this classy hotel’s interiors, as well as the astonishing handcrafted furnishings. Wander down to Bar Balam and treat yourself to a classic cocktail with a fun Mexican twist, or book yourself a table at Cueva Siete for a flavoursome taste of authentic Mayan and Yucatecan cuisine. Best of all, you’ll have your own Anfitrión – a personal host who will be available to you 24 hours a day. 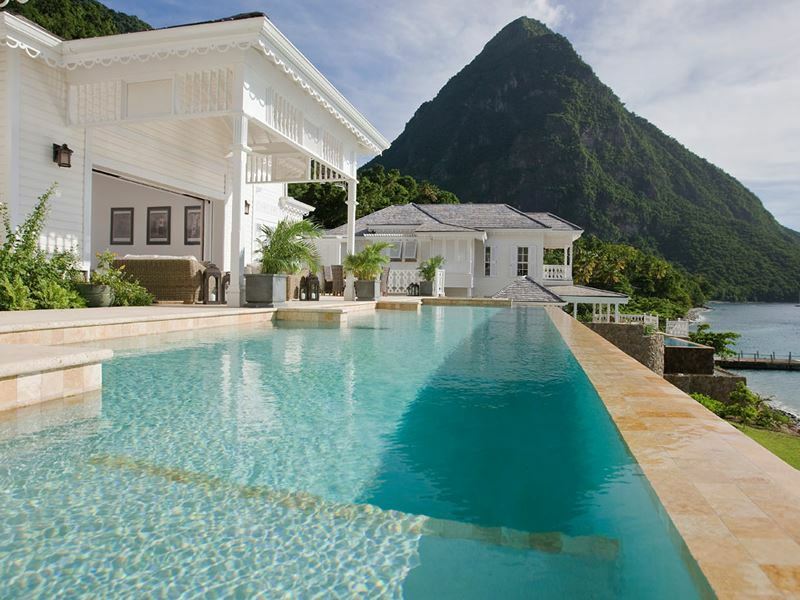 Reminiscent of a picturesque Spanish village, Cap Maison is easily one of St Lucia’s most stunning resorts. With mixed tile floors, terracotta walls, and a marvelous central water feature, your breath will be taken away around every corner. As soon as you step into the resort for the first time, you’ll think you’ll have landed in paradise. The sweet scent of lemongrass will sweep you off your feet as you’re handed a cold towel and a refreshing welcome drink – a wonderful service that will remain throughout your entire stay. We love The Cliff, a spectacular restaurant with unsurpassable views of the sparkling ocean – the perfect backdrop to your freshly caught seafood. 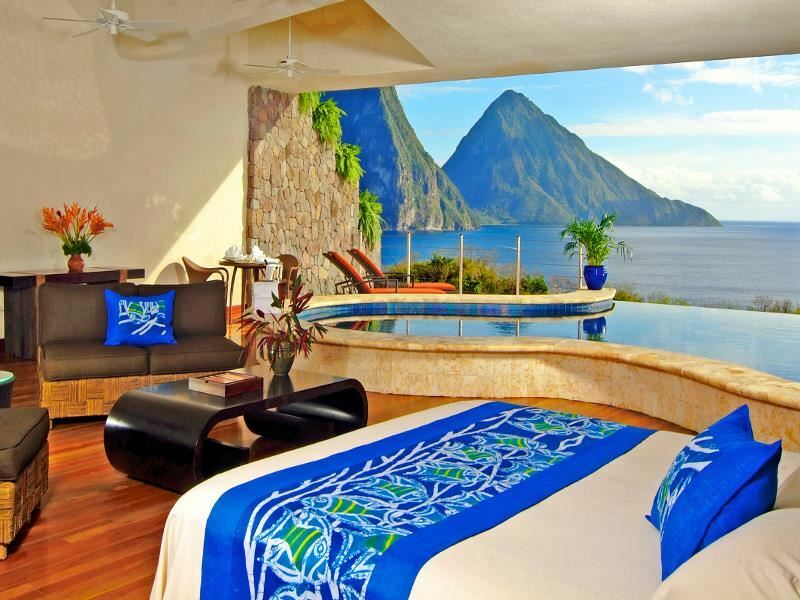 Located just outside St Lucia’s former capital, Soufriere, Ladera Resort has the most phenomenal views of the Pitons and the azure Caribbean Sea that surrounds them. This beauty transpires into the resort’s attractive exterior too – what could be more beautiful that staying in a suite perched high up in a luscious hillside? Most of the rooms have open walls that look out onto the endless horizon, as well as a small private pool ideal for taking a refreshing dip and watching the sun set. We love the main infinity pool – it’s built much like a natural lagoon, whilst the Dasheene Restaurant offers stellar views from the open-air terrace and divine award-winning cuisine. A stay here is truly indulgent and special.